The First Fleet of 11 ships, each one no larger than a Manly ferry, left Portsmouth in 1787 with more than 1480 men, women and children onboard. Although most were British, there were also African, American and French convicts. 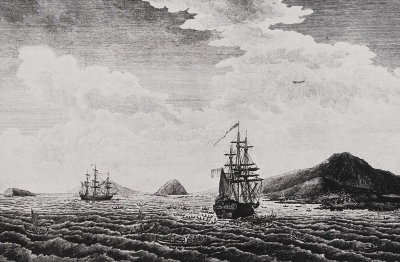 After a voyage of three months the First Fleet arrived at Botany Bay on 24 January 1788. Here the Aboriginal people, who had lived in isolation for 40,000 years, met the British in an uneasy stand off at what is now known as Frenchmans Beach at La Perouse. On 26 January two French frigates of the Lapérouse expedition sailed into Botany Bay as the British were relocating to Sydney Cove in Port Jackson. The isolation of the Aboriginal people in Australia had finished. European Australia was established in a simple ceremony at Sydney Cove on 26 January 1788. Discover the 1787 Draught Instructions for Governor Phillip that empowered Captain Arthur Phillip to establish a British Colony at Botany Bay, grant land and issue regulations to the Colony from 1788. Discover the 1787 convict love token made for Thomas Tilley a convict on the First Fleet. Discover the Lapérouse Museum's collection of objects from the ill fated expedition of Jean François de Lapérouse in 1785 -88, France's great voyage of discovery of the Pacific. 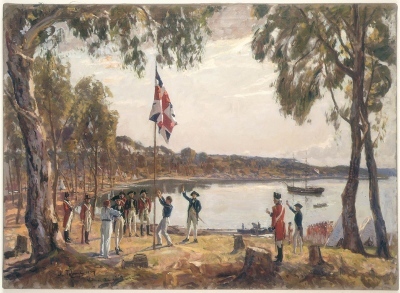 La Pérouse met the British First Fleet and Aboriginal people at Botany Bay NSW on the 26th January 1788.